Having built up a solid customer base online, sound and lighting equipment retailer Soundsavers have opened a store in the Headingley area of Leeds. The Soundsavers website was established in 2003, and quickly became a leading supplier of PA systems, DJ equipment, stage lighting and disco lighting. However, trading ceased abruptly in May 2010 with the surprise collapse of HBMR Ltd and the website was put up for sale. Leeds-based couple Scott Forrester and Sandy Lillis heard about the site’s sale, and saw a perfect opportunity for a new business venture. Soundsavers Limited was formed, the website purchased, and the site began trading once again in December 2010. The showroom can be found in the vibrant centre of Headingley, just a stone’s throw from the famous cricket ground. It’s nestled amongst an eclectic collection of café bars, restaurants and shops, all well frequented by the area’s thriving student community. The showroom is split into two sections: a pro audio section, kitted out with a range of gear for live sound, home studio and DJ equipment, and a lighting showroom which - with the flick of a switch - can demonstrate an impressive array of moving heads, scanners, lasers, and special effects. Brands on display include Audio-Technica, Electro-Voice, LD Systems, LEDJ, Numark and Yamaha to name but a few. Several jobs have been created as a direct result of the shop opening, and one vacancy for a Retail Assistant remains, details of which can be found on Soundsavers’ website. 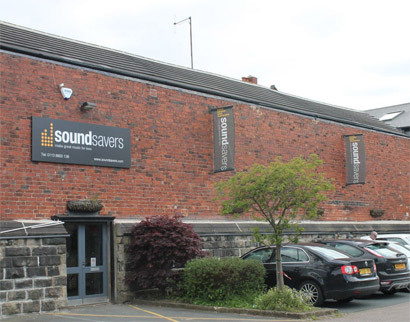 Soundsavers’ new showroom is located at Grunberg Street, Headingley, Leeds, LS6 3HH. The customer entrance is accessed via the Headingley Taps car park, which is open to the public and free of charge during business hours.